So far in this discussion about the four translations we have examined word choices, sentence structure, “meaning,” etc. But another critical aspect of translation usage for a congregation involves memorization and liturgical use. Let’s be clear, all four translations can be memorized and can be used in liturgical worship. There is nothing special or unique about them. Some might be easier to memorize, some hard. But all can be memorized. For both of these translations, I include visual layout because they affect the oral reading of the text, one negatively, the other positively. I have almost developed a love vs. not-so-loved sense about HCSB. There are many things to commend it. But in this particular area of oral suitability, it is actually a visual stumbling block. Obviously oral readers should practice reading the texts before standing in front of the congregation; sadly many do not. This is not a translation issue but rather an editorial and design layout issue. HCSB follows the NKJV in layout (two-column pages) for poetic sections. In the process, the choppiness of the layout leads to many short phrases on different lines. See this example in which many lines have between two to five words, and that makes it difficult to read silently and orally. In contrast, GW design layout favors a very good approach to oral reading, and even personal reading. Notice in the photo, how the single column allows the reader to follow the entire pattern and sentence structure visually. For me, that has been one of the best features of the GW translation. Both translations offer acceptable contemporary English. The slight difference is that HCSB uses some contractions, but often not in direct discourse by God, whereas GW tends to use the contractions often. From an oral reading standpoint, GW is more consistent. Even in more formal settings, contractions are not uncommon, and contractions certainly do not change the text meaning. Next consider Isaiah 22:17, where ESV especially had the awkward “seize.” These two translations avoid the awkward phrasing, but perhaps a little too much. Again both translations offer a readable text for the second part of the verse. It might be interesting to see how or whether people see a difference between “grieved” and “offended” in the first part of the verse. 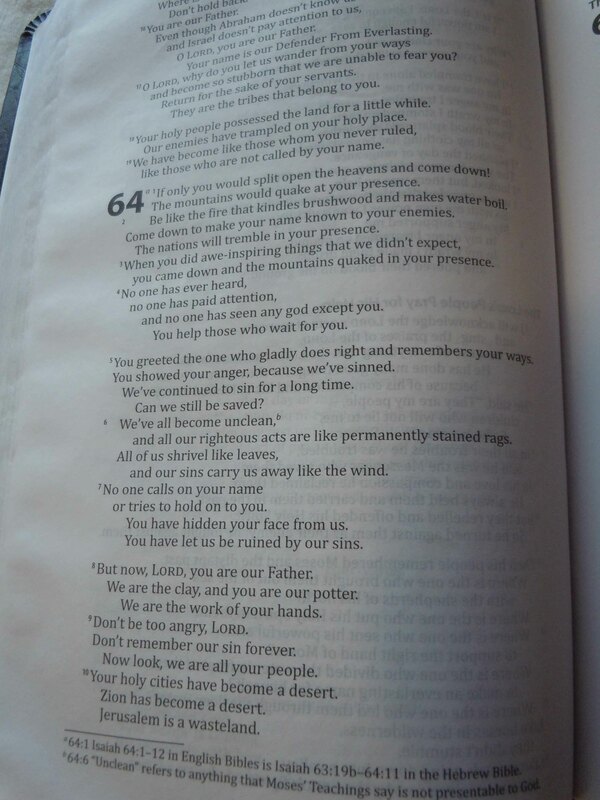 In the last decade or so, “offended” can most often be seen as “hurt feelings” which is not often interpreted as a big deal, as expressed in “If I have offended you, I’m sorry,” which is clearly not an apology, and different than this particular Biblical text. Regarding split quotations in speech, HCSB has its own share of these. Thus, while it doesn’t have as much as ESV, it still does in other texts. “Who are You, Lord?” he said. In this text, HCSB splits the verbal response, whereas, GW moves the indicator phrase “the person replied” to the beginning, and so that the response is complete in itself. Again, this doesn’t change the meaning, but in oral reading it would be easier to follow GW than HCSB. In looking at Matthew 15:16, we see that HCSB and GW offer a good translation that is more accurate than the NIV 2011. Interestingly HCSB translates καὶ as “even” whereas most translations would use “also,” or in this case subsume it under “yet” (as does GW). 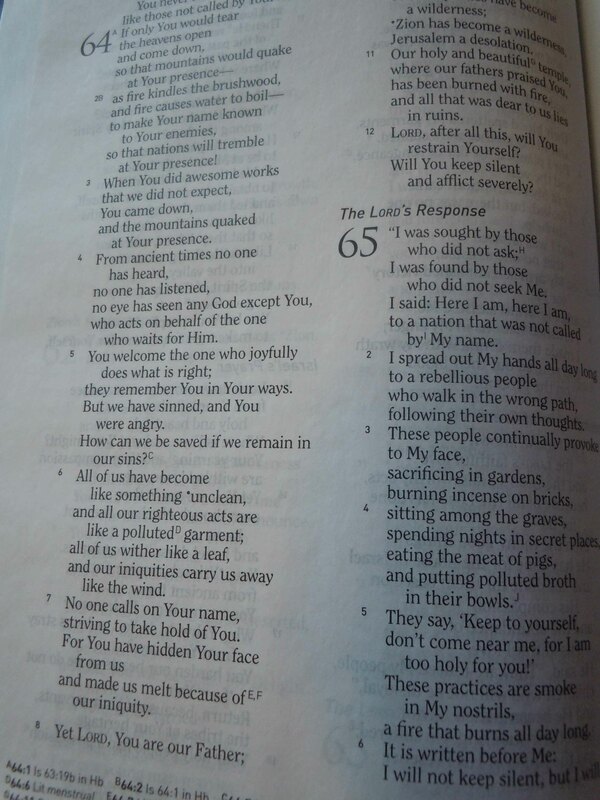 The last text is where NIV 2011 had “all who make spoil of you I will despoil.” Both translations provide a good parallel structure and verbal connections without resorting to odd or out of date language. Since this is only a cursory look at the four translations in very limited selections, I do not propose that this is the definitive guide for translation choice based on oral readability. However, just from the few examples given, and much more in actual use over the past few years (except NIV 2011), I can say that these are indicative of the translations in total. ESV remains a solid translation, but from an oral reading and public worship use, it is the most difficult of the four translations. Despite some recent electronic changes, the basic flaws noted here remain. For me the surprising one was NIV 2011. For years I had heard how people praised the NIV for its readability, even if they did not approve of the translation as a whole. However, I suspect readability for many making that claim has to do with private (silent) reading; and so the claim may have been true. But as I have listened and read orally the NIV, and now NIV 2011, I find that its oral sense can be a stumbling for readers and listeners. HCSB is a solid translation, and I think in many cases better than ESV and NIV 2011. But the layout design and some sentence structures do hinder its oral presentation. GW has from its inception been a translation with always an eye on readability, and especially oral comprehension. The design layout for GW is by far the best thought out among all translations, not just these four. And what about memory work? My sense is that if the majority of the congregation comes from a traditional background, then ESV would be the choice. For those in the tradition of the last 30+ years with the NIV, then NIV 2011 makes sense. Even the HCSB is close enough to the KJV tradition that it might be acceptable, but would take some work on some familiar passages. GW is the most different of these, so memorizing is possible, but there would not be any confusion about “Is this NAS, NKJV, ESV?” This translation makes sense in the environment in which most of the congregation and its surrounding mission field is unchurched background. There is nothing to compare. The challenge for those memorizing GW is if the person moved to a new congregation in which a more traditional translation is used.